Permuation tests (also called randomization or re-randomization tests) have been around for a long time, but it took the advent of high-speed computers to make them practically available. They can be particularly useful when your data are sampled from unkown distributions, when sample sizes are small, or when outliers are present. R has two powerful packages for permutation tests – the coin package and the lmPerm package. In this post, we will take a look at the later. The lmPerm package provides permutation tests for linear models and is particularly easy to impliment. You can use it for all manner of ANOVA/ANCOVA designs, as well as simple, polynomial, and multiple regression. Simply use lmp() and aovp() where you would have used lm() and aov(). Consider the following analysis of covariance senario. Seventy five pregnant mice are divided into four groups and each group receives a different drug dosage (0, 5, 50, or 500) during pregnancy. Does the dosage of the drug affect the birthweight of the resulting litters, after controlling for gestation time and litter size? The data are contained in the litter dataframe available in the multcomp package. The dependent variable is weight (average post-birth weights for each litter). The independent variable is dose, and gestation time and litter size are covariates contained in the variables gesttime and number respectively. dose         3  122.8   40.93   2.562 0.06196 . 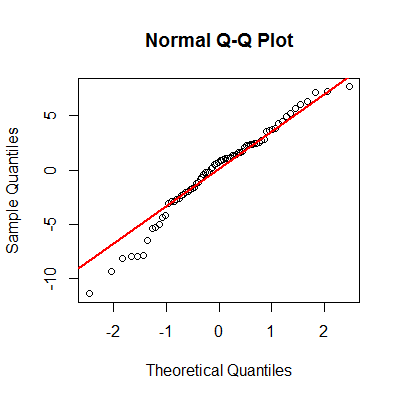 One of the assumptions of the ANCOVA model is that residuals are normally distributed. Let’s take a look. From the graph, we have to question the normality assumption here. Note the deviations from the line. An alternative to the tradional analysis of covariance is a permutation verion of the test. The test is valid even if we violate the normality assumption. To perform the test, simply replace the aov() function with aovp(). "Settings:  unique SS : numeric variables centered"
There two things to note here. First, the aovp() function calculates unique sums of squares (also called Type III SS). Each effect is adjusted for all other effects, so order does not matter. Second, the dose effect is now significant (p = 0.038), suggesting that drug dose impacts birth weight after controlling for litter size and gestation period. There are many situations were traditional linear model significance tests are not optimal (including when data is notably non-normal, there are outliers, and when sample sizes are too small to trust asymptotic results). In these cases, permuation tests may be viable alternatives. To learn more about permuation tests in R see chapter 12 of R in Action.